Having a pair of strong and symmetrical shoulders is crucial in building a balanced V-shaped torso, as they create the illusion that your waist line is narrower. Strong and developed shoulders will also help you in performing other exercises, because they are involved in almost every compound movement aimed at upper body development. The deltoids consist of three heads (front, medial and rear head), and if you want to avoid their underdevelopment you need to pay ample attention to all three of them. Underdeveloped shoulders do not only reflect negatively on the overall aesthetics of your physique. As they are involved in many of your upper body exercises (the bench press for example), weak shoulders can also hinder the development of your chest and back muscles. In this article we’re providing you with a four week program that will help you fix or avoid the problem with weak shoulders The program has been created by combining the powerlifting and bodybuilding workout techniques and relies on progressive overload. As we’ve already mentioned, the delts have three heads. Each of these heads performs a different function and can be hit with different exercises. 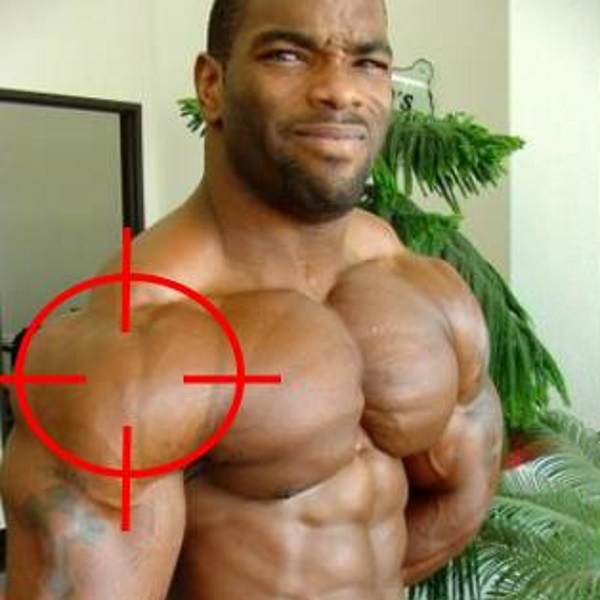 For example, the side delts are involved in abduction of the shoulders i.e. in side raising of your arms. We are going to work the lateral head with lateral raises and wide grip upright rows. The rear delts are involved in lateral movement away from the midline of the body in a horizontal plane; moving the upper arm away from the chest with the elbows out to the sides. This is also known as transverse abduction of the shoulders. There are several exercises that hit this head. The incline rear lateral rise, cable face-pull are just some of them. The front delts move your arms straight in front of you and over your head. This head is best hit with the front rise, the overhead press and upright rows. Muscle size and strength are a result of several processes. They are determined by the loads you are using, metabolic stress and microtrauma of the muscle fibers. Squats, deadlifst, bench press and overhead press exercises in this workout protocol utilizes different number of sets and reps in the exercises for every week. All the other exercises are performed with the same number of sets and reps, but are done using drop sets, giant sets and rest-pause training. Use straight bar when performing bench presses, squats or deadlifts. * Finish the set by holding your chin over the bar on the last rep. Try holding as long as possible. ** Perform the pushdown either with overhand or underhand grip. *** The pushups should be performed by placing your hands on dumbbells wider than shoulder. Execute them using the rest-pause protocol, with rest periods of no longer than 20 seconds. * The lateral pulldown can be performed either with overhand or underhand grip. ** Use a bar with no weight. Execute them using the rest-pause protocol, with rest periods of no longer than 20 seconds. * Place hand on dumbbells when performing this exercise. ** Reduce the weight by 10 to 20 pounds after the first set and perform the last set by increasing the weight by 60 pounds. ***The four seated dumbbell exercises are performed as a giant set with as little rest as possible between each exercise. * Perform the pullups with three to five seconds on the negative portion, followed by pulling uu as quickly as you can. ** Lie with your face down and use dumbbells that do not exceeded 30 pounds. Execute them using the rest-pause protocol, with rest periods of no longer than 20 seconds. The delt workout can be really exhausting. We provide you with several pieces of advice on reducing the pain. Warm up your chest, lats, upper back and triceps by performing a 30 seconds foam rolling for each of these muscles or muscle groups. Have in mind that the whole point of the warm up is to improve blood flow in your muscles preparing them for the real challenge. Avoid exhausting them in this stage. A stronger back allows you to go heavier on the press. Performing the pullups, lat pulldowns and rows with increased volume will translate in better form and improved shoulder health. You can reduce the pain of performing the seated dumbbell press by changing the angle – using high incline instead of 90 degrees angle. This change of angle also allows using greater loads, providing real workout for the delts. Using a barbell forces you to place your wrists, elbow and shoulders in a fixed position. Using dumbbells instead will allow you to add minor variations of your press. By performing the press with neutral grip, you eliminate the pain that sets in your tendon with an overhand grip.